A lot of hard work has gone into preparing your eLearning course. You took care of every little detail – made a perfect storyboard, cross-checked facts, prepared assessments, interactivities, checked the functionality of the course, and it’s almost done and ready to be rolled out. However, you feel something is missing. Yes, you are right; you overlooked making your online training visually attractive. Though the course content is great, when it’s not visually appealing, there is a possibility of missing your learners. So, here are 10 visual design tips to take your online employee training to the next level! Learners are less likely to read text-heavy slides. 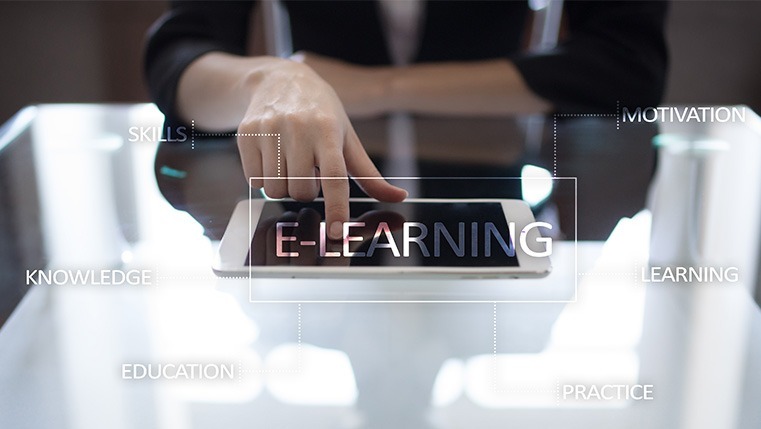 To make your eLearning more acceptable and look great, don’t use more than six bullet points on each slide. This provides decent space for images, video, and infographics to balance your text. Remember, less is always more in eLearning context. To make your eLearning attractive, don’t go for attractive fonts. Seriously! They may be nice to see, but difficult for your learners to read. Don’t use cursive style and fonts with embellishments. Sans serif fonts are more legible than serif fonts. Arial, Calibri, Tahoma, Verdana, Helvetica, and Comic Sans are some examples of sans-serif fonts. Times New Roman, Century, Garamond, and Georgia are some examples of serif fonts. Keep the font sizes and styles consistent throughout the course to minimize distractions. Create a style guide that defines the text size for titles, headers, bullet points, etc., throughout the eLearning course. Once you set guidelines, just follow them. For example, if your title size is 32 on one slide, bold Tahoma font, then it is applicable to titles on all slides. Viewing plain black text on white background turns out to be boring after some time. Use colors appropriately so that they influence and engage learners. Avoid loud background colors. Don’t opt t for bright colors. Stop using too many colors; you might think that will get learners’ attention, but that’s not true in most cases. Weird color combinations make it difficult for learners and they face problems concentrating. So it’s always better to keep your color scheme simple and toned down. To make your text readable, stop using pictures, heavy colors, and patterns as backgrounds for your course slides. This will avoid unnecessary distractions. If you want to use pictures or patterns in the background, a faded effect will work better. You can use bold/strong colors to get learners’ attention, but don’t go for bright colors. Using florescent shades gives an unprofessional look and it makes reading hard for your learners. Proper use of graphics, illustrations will have a positive impact on your learners. But you have to include illustrations of high quality. Avoid using expired clip art, poor quality drawings, and unpolished illustrations. Images are used to explain and visualize concepts, so use current images in your eLearning course. Adding pictures to your eLearning course is a great value addition, but doing it with a purpose will bring the expected results. Incorporating a picture that’s nothing to do with the lesson is of no use and will distract learners. Use pictures that your learners can easily relate to the course. For example, if your course is aimed at healthcare professionals, showing nurses, physicians in images would be relevant and bring a higher response than using pictures with of executives in business suits. Break the textual monotony of sharing information with graphs and diagrams in your online learning course. Now in a media dominated society, people’s data consumption behavior has changed drastically. Presenting information visually has become the new necessity for businesses to make sense. So publish data in the form of graphs and diagrams for a better reception from your learners. Giving descriptive titles to your graphs/diagrams will help your learners understand better. Carefully picked colors and fonts, high quality images and graphs will add appeal to your course content in a compelling manner. So, take all these tips to beautify your online courses and get amazing results!